How do you like my latest thrift store score? A Ralph Lauren halter side tie dress in luxurious silk. I have a confession to make…I am a hobby thrift shopper. The challenge of discovering gems hidden amongst the racks of discarded items excites me. I could choose to buy clothing at a regular retailer but I find the thrill of thrift shopping exhilarating. Thrift shopping allows me to experiment more with styles and clothing I would never consider otherwise. Without a doubt, I love the fact that thrift shopping enables me to recycle and reuse items that would otherwise end up in landfills such as this amazing piece. I was mindlessly going through rack upon rack of clothing thinking it was going to be a bad thrifting day when I finally stumbled upon this dress. Thrift shopping requires patience, determination and luck. You need to work your way through stacks of awful clothing to find some quality treasures to call your own. After all that searching it truly does feel like you’ve discovered an honest to goodness treasure. My sense of touch lead me to this piece, thick high-quality silk, next my eyes followed admiring the dark Autumnal hues, my colours. It looked a little big and maybe it is, but overall I don’t mind. 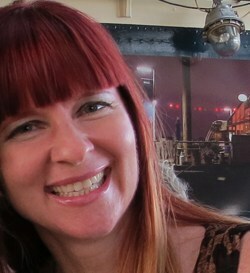 It falls away from the body, the neckline creates a gorgeous focal point near my face. I was delighted to see that my 1970’s vintage sunglasses look like they were meant to be with this dress. This dress is a big win. Some stores are better than others. Once you go to a store a couple of times you will know if they receive higher quality goods regularly or if it is all cheap, fast fashion. 2. Thrift shop when you have time. You cannot thrift shop when pressed for time. When you’re digging for diamonds it takes time. Stores are often restocked daily. 4. Shop secondhand when you are in the mood. There is nothing worse than stepping in a smelly, cramped, poorly lit store when you are hungry, tired and just want to curl up into a fetal position and go to sleep. Shop when you are energetic and your creative senses are peaking. 5. Start with your favourite section and work backwards. Thrift shopping can be exhausting. Most thrift stores are divided into sections, men’s, women’s, children’s, and then divided again into subsections, dresses, skirts, pants, tops etc. I always start with my favourite section, the item I wear most often, which is dresses and then work backwards, skirts, blazers, jackets, tops, shoes, handbags, bottoms. If you are looking for something in particular, head straight to that section. 6. Let your sense of touch guide you. This is a time saver. I can go through racks at warp speed simply by touching the fabric. Polyester feels very different from cotton, silk or wool. Teach your fingers to identify quality fabrics. 7. Keep an open mind. Thrift shopping is all about possibilities and keeping your mind open to new options. Don’t disregard something because you’ve never worn that style before or you don’t know that particular brand. Judge an article based on colour, style, fit and quality before you toss it aside. 8. Size doesn’t always matter. Sizing is all over the place depending on brand and the year that the garment was made. Once you thrift enough your eyes will become trained to visually identify pieces that will fit you rather than relying on the size indicated in the garment. Having a small measuring tape handy saves you loads of time running to the change rooms. 9. Visit the men’s section. I’ve purchased both jeans and t-shirts for myself from the men’s section. 10. Check the fabrication tags. The very first thing I do when I’m considering trying on a garment is to check what it is made out of, and who made it. You can discover if it is vintage often by looking at the label. Most items that are made in Canada, the US or Europe can be dated from 1980’s or earlier prior to fast fashion, mass production and outsourcing manufacturing overseas. If you are unsure of the brand and pricing check online with your phone. 11. Turn the garment inside out & check the pockets. This is how you check the seams to ensure they are straight and finished properly without any fraying, separation, gaps or holes. Often people will forget items in the pockets, mostly kleenex but other thrifters I’ve know have sometimes found cash. Checking the pockets enables you to discover if there are holes in the lining. 12. Hold the garment up to the light and look at every inch of it. Staining and holes cannot be seen in poorly lit stores. 13. Bad smells are a fact of thrifting. Items purchased should be washed as soon as you get them home, or placed in a plastic garbage bag sealed shut until they can be washed. All items should be placed in the dryer for 15 minutes to eliminate the possibility of bedbugs. Smells in leather and suede are very difficult to remove. I kept one leather jacket outside for months and it still stank. I finally took it to be professionally cleaned which did remove the odour, however, it was very expensive. Take dry cleaning costs into consideration when buying leather or suede. More porous fabrics can be set outside in the sun to breathe for a few days which often solves any residual odour issues. Baking soda inside handbags will help remove stubborn smells. Pour about a cup of baking soda into the handbag, close it and forget about it for a week or two. Vacuum it out and wipe out the inside with a damp rag. I’ve also used a scented dryer sheet in place of the baking soda. Wiping items with a damp cloth in a solution of vinegar and water will also help eliminate bad odours. Sewing on a button or taking up a hem are things I am able to do on my own. If I find a piece I really love and it requires professional alterations I take into account the cost of the alterations prior to purchasing. Items which need to be taken out require enough additional fabric in the seams to allow enlargement of the piece. A quick trick for creating a smaller silhouette on a jacket or blazer is simply moving the button or buttons. Wear something that is very easy to take off, such as a slip on skirt and t-shirt. Don’t waste precious time getting undressed and dressed. Often when thrifting I will wear a dress that slips off over my head, but I am then required to bring a top into the fitting room if I am only trying on bottoms or vice versa. I know other thrifters that wear leggings and tank tops so they can try on all their items without ever visiting a fitting room. Personally, I prefer the privacy that a fitting room affords. 16. Know the styles and colours you like and what works with your body type, complexion and hair colour. This is HUGE and will save you so much time. I know I don’t look good in white so I avoid it. I also know I don’t look good in boxy styles so I avoid them (most of the time). 17. Reevaluate your purchases prior to heading to the cash. I always do this. It is too easy to be swayed into buying something because it is inexpensive. Be realistic. Remember how much room you have in your own closet and really consider if it is a piece you love or something that is just “meh”. Toss the “mehs”. 18. Ask about in-store specials and points cards. My favourite thrift store, Talize, has a daily manager’s special which they announce regularly over the intercom and a points card that affords additional savings. I only do this in private thrift stores when I’m either paying in cash, buying more than one item, or there is a flaw in the item I’m purchasing. I’m never rude about it, but if you don’t ask you’ll never know if they are willing to negotiate. I often use this tactic at vintage shows. 20. Get to know the store owners. If you frequent the same small independent thrift store often you may get a chance to know some of the employees or the store owner on a personal basis. This is a brilliant opportunity to leave your number and have them call you when a specific item or brand you’ve been looking for comes in. 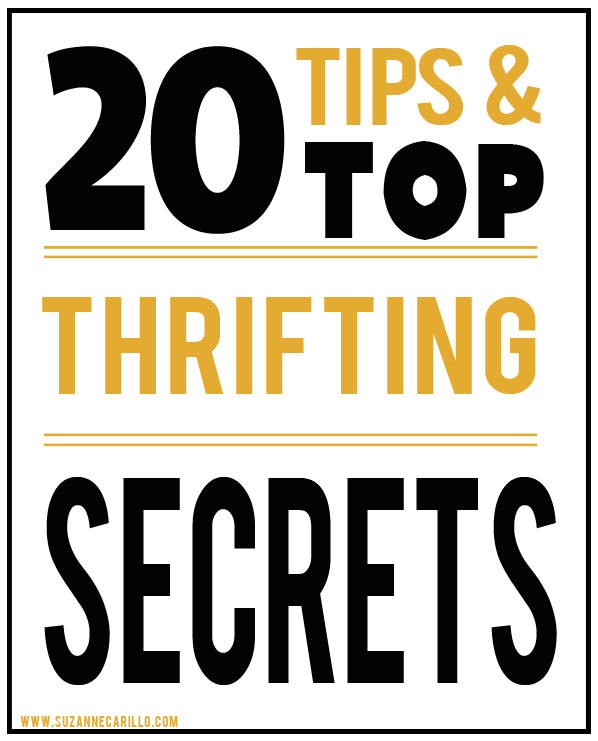 Those are 20 of my best thrift shopping secrets. You are now armed with the advice of a professional thrift shopper. Go out and conquer my friends, and may the thrifting Gods be with you! 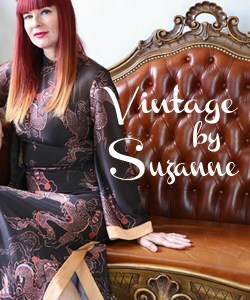 Some of my favourite estate sale and thrift store treasures can be found at Vintage By Suzanne. Do you have any thrift shopping tips or secrets of your own that you’d care to share? I especially appreciated the “smells”….I totally agree. I once tried to remove odour from a leather bag, airing, cleaning even filling it with cat litter (this can work) but it never smelt good enough to use. So depressing as it was not only beautiful but I have pushed my charity shop budget a little in order to get it. That is the joy of the whole experience! Like the idea of the cat litter. It really works, especially with shoes! I have found some stores are worse than others for smells. You might need to search out a different store. I often find very small stores can be worse because there is no air flow. #13 and bedbugs — thanks for that one! Here’s a tip for those of us that think our waist is smaller than it actually is — before taking something to the dressing room, instead of holding the waist up to yourself across your front, hold it from your bellybutton to your spine. Works like a charm and you will be less sad in the dressing room. Look out for moth signs (food stains, look under collars, turn ups) – I always hang everything outside to air and examine – then it gets steamed with my trusty hand steamer or if it is small enough – goes into a plastic bag and into the freezer for 48 hours. I have to be totally smitten to do this btw. Usually anything that isn’t in a great condition doesn’t come home with me ; see also, ripped jacket linings (pricey to replace), stains or anything reeking of perfume/cigarettes/hairspray. Shop out of season – summer is great for coats lol! I’d forgotten all about using a steamer! This after I steamed a bunch of pieces yesterday. Thanks for reminding me! I need to add it to my tips as it does do the trick and kill bed bugs. I have read from anywhere up to 3 months to just 4 days for killing bedbugs with the freezer method. Two days is even better. A wonderfully informative posting Suzanne! One additional tip is to shop one size up and one size down from your perceived size. I marvel at the number of items with a “large” tag that aren’t even close to that size but have clearly shrunk. I think another bottom line is a realistic knowledge of your own body. I have broad shoulders, long arms and a small bust. Although a size large accommodates most of those requirements it can miss out on my small waist and average hips. Despite all of those issues I know what works and what doesn’t and a big part of that is being flexible about my “perceived size”. Don’t let a clothing rack’s size label be your guide to reality. I think this is true in regular retail but even more true in thrift and consignment shopping. This is so true Marilee. Sizing is truly just a “suggestion” and should be taken as such. Thanks for the great thrifting tips. A question about # 13, putting all thrifted purchases in the dryer for 15 minutes to eliminate bedbugs. Do you have it on high heat, or medium or low? I ask because the things I buy from thrift stores usually can’t shrink even a little and still fit. But, I want to do whatever it takes, because the yuck factor is definitely important here. Also, #8 is a a good one. I look at all kinds of sizes, because maybe the reason the person donated it is because it shrank when washed or dry cleaned. It only needs to be at medium heat. I have thrown dry wool and cashmere garments (notorious for shrinking) into my dryer at medium heat for 20 minutes and they never shrank. 15 minutes at medium heat should be safe. Try it with one article first, just to be on the safe side. That inner dialogue? LOL…maybe it’s my imagination, but I kinda think you say it out loud sometimes. First, that dress forgives even the worst of thrift store outings. What a jackpot. It looks sensational on you! Your tips are all spot-on. Another one I’d like to throw in is don’t be seduced by labels. That Betsey Johnson label might be impressive but if the piece isn’t exactly right, don’t waste your money. The smells, yesh. Nasty, nasty. I’ve put clothing in a ziploc bag with a couple of open boxes of baking soda and left them undisturbed for months. This works fairly well. I’ve never tried it on leather. I use high heat on my dryer for one hour after a hot wash if I think the garment can handle it. Overkill? Bwahaha, get it? Sorry. I hope this post inspires more people to thrift, Suzanne!! You’re the best example of the rewards that come with a little patience and digging. This is a GREAT tip! I too can sometimes be seduced by a high end label. I think I just nee to go thrifting with you and see a pro at work. I think probably not expecting to find something is the best mindset so you will feel like you’ve struck gold when you do find that special piece. This is such a pretty dress. I’d LOVE to go thrifting with you Alice! : ) It’d be a blast! That dress is a great score! My inner voice says the same things as yours when sorting through a rack at a thrift store. I’ve had pretty consistent good luck at Talize, but have given up on Value Village, at least the ones where I live, which are full of cheap crap at ridiculous prices. Excellent tips for thrift shopping – I agree with Mel about not being seduced by the label. I found a Prada dress once, gorgeous, but was too small for me, and I wanted to buy it because it was Prada (I didn’t). I had to get rid of a long suede skirt because I couldn’t get the perfume smell from the previous owner out of it and I didn’t love it enough to get it professionally cleaned. I’ve personally experienced what you hint at — that the joy of finding a terrific piece (like this one) is magnified by the chore of wading through piles of crap. The work required makes the achievement feel all the sweeter. I adore, Love, worship that dress! What a steal and a treasure, it looks like you just bought it from the flagship stores! I do most of the things, but some of your advice is new to me, so I am glad that I read this! Very good advice. This helps a lot. Loved the part of “nope, no, ugh, etc.”. Laughed our loud. I could hear you do it haha. Yes, Yes and Yes to all your tips, Suzanne. I do have to be “in the mood” and if so, I find the clothes jumps out at me. 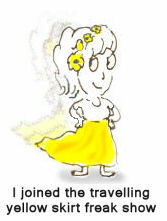 I also made a pledge a while ago that if a garment has imperfections that need alterations/mending etc. I put it straight back on the hanger because in the past clothes have sat “in waiting” for the appearance of my sewing machine or needle and thread. I tend to be attracted to the colors I love and look good in and reach for those and then feel fabric and check labels. That dress is fantastic on you but girlfriend, you could get the waist nipped in a bit and it would be even more incredible. Just sayin. Thanks for the fantastic advice! First—that dress is positively lovely!! The print–the bow at the neck—it’s just heaven sent! Second—great tips. I think the smell is one of the reasons my husband hates going to these stores (at least the goodwill, savers versions—the smaller consignment stores aren’t as smelly). I’ve always liked thrifting for the great deals, but you’re right—it’s also great for the environment—reuse & recycle! Your tips were very good, dear Suzanne, and OMG, true, bedbugs and bad odour… well, the cost of dry cleaning and any type of cleaning and alterations must be evaluated, of course. I have seldom gone to charity shops, mostly because of that – alterations. But that shouldn’t put us off 🙂 I had to smile when reading your inner talk, no no no, nope, uh, ugh 🙂 And finally, what’s that here? This gorgeous Ralph Lauren dress is a gem, glad that you found it! You look really very beautiful, this dress is definitely incredible! Hope you have a very beautiful week! Bisous! I just don’t have much luck thrift shopping here. I think every woman that’s my size in town must be hoarding their clothes because there is never anything in my size. That doesn’t stop me from looking though! First off, what a fabulous find your dress is, I love the neckline-stunning! Thank you for putting together this ABC Guide to thrifting! I love thrift shopping for the unique, one of a kind items I find. If these pieces could tell us their story, how fun would that be? Such great tips. For me, the biggest thing is taking time. You can’t find the treasures unless you give it time! LOVE this dress on you – it’s perfect! What a Beauty! Cant believe you find that one in a second hand store! I dont think they are the same as the ones in the Netherlands! I once bought a black lacleather long jacket on a second hand Market in Amsterdam, it was THE perfect coat, but…It had that smell. I imagined the whole time that someone died in that coat! Dont know where that idea came from…. but I have this thing with second hand stuff and dead people! You look amazing though….Lol? no seriously, you do! That dress really is fabulous, what a great find! You certainly know your stuff. Suzanne, that dress and you were meant to be! It looks fabulous on you. I could see it working for Autumn with those gorgeous colours – maybe with boots, a belt, and a V-neck cardi that still shows off the halter neckline underneath. Great tips for thrifting. We had a good thrift day yesterday – in a pile of cheap scarves, I found the sole silk one (£1! ), and my husband asked in the back room about hats and came away with a cowboy hat. Another tip of mine would be to invest in a hand-held steamer. These are fantastic for restoring shape and cleaning things that aren’t easily cleaned, like suit jackets. Great tips Suzanne. Many of the same tips apply to estate sales, which I’ve been a fan of for years. I have a small freezer in my basement for pieces that can’t tolerate the dryer. I have found that the freezer can be used for shoes, which solves the odor problem. I also use all of my senses to find treasures, as you describe. Second hand shopping is so much fun! I find it to be far superior to retail! !